The partnership between NEC and the port illustrates the strengthening relationship between Tokyo and New Delhi. Japan is seeking growth markets, while India craves advanced technology and foreign investment. Many of the cargo containers passing through the port in Mumbai have a small piece of Japan Inc. attached: Devices from NEC Corp. that can be tracked as the containers rumble through the interior of Asia's third-largest economy. The partnership between NEC and the port illustrates the strengthening relationship between Tokyo and New Delhi. Japan is seeking growth markets, while India craves advanced technology and foreign investment. The leaders of both countries, Shinzo Abe and Narendra Modi, are also working to counter the growing regional influence of China -- an important economic partner to both but also historically a rival. "We have the two largest democratic economies in this region, we respect international rules, openness and transparency -- these are basic principles that we share," said Kenko Sone, a former head of global communications for Mr Abe who now serves as minister of economic affairs at Japan's embassy in Delhi. Japan is pouring money into India. Lending for development, particularly infrastructure, has grown nearly sixfold since 2001, totaling 366 billion yen ($3.2 billion) in 2015, the most recent year for which data is available. 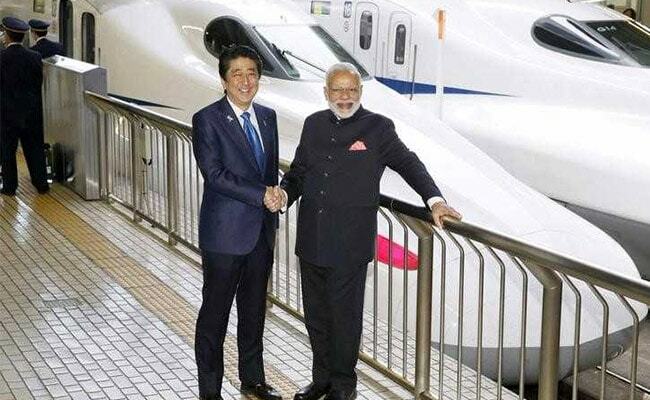 The two nations are working together on infrastructure projects that include the $100 billion Delhi-Mumbai Industrial Corridor and a Japanese bullet train to run between Mumbai and Ahmedabad in PM Modi's home state of Gujarat. India's young population is an attraction for Suzuki Motor Corp., majority owner of India's biggest car maker, Maruti Suzuki India Ltd. The company makes about 1.5 million cars a year in India, but aims to produce 2 million annually in 2020, according to Satoshi Kasukawa, a Suzuki Motor spokesman. "India's population is pyramid shaped, and it's possible for us to provide entry cars to young people," Kasukawa said. Japanese manufacturers are increasingly using India to make products destined for other emerging countries. Many of Japan's major automakers are already selling India-made vehicles in Africa, while Hitachi Construction Machinery Co. has started distributing its machines in Africa after a joint venture with Tata Group went well, according to the Japan External Trade Organization. With Mr Abe fresh off an election victory and PM Modi predicted to win a second term in 2019, the alliance between the two countries is expected to grow for years. Political stability in both Japan and India gives the two nations confidence to build deeper economic ties while strengthening the strategic relationship, Japan's Sone said. The two countries are also attempting to rival China's ambitious Belt and Road Initiative, creating the Asia Africa Growth Corridor in an attempt to grow export markets. PM Modi and Mr Abe launched the initiative at a meeting of the Asian Development Bank in May 2017 -- shortly after China hosted various countries at a Belt and Road forum in Beijing. Japan also hopes to sell defense technology, perhaps including Soryu submarines, to India as PM Modi tries to modernize the country's aging, largely Soviet-era military equipment. They have also stepped up military cooperation, with Japan joining the annual Malabar naval exercises with India and the United States in the Bay of Bengal, designed to protect "shared interests" in the region. "India and Japan are in a sense front-line states of a rising and more assertive China," said Manoj Joshi, a distinguished fellow at the New Delhi-based Observer Research Foundation think tank. "The U.S. is an ocean away, the Europeans even further. Both know that by themselves they are not sufficient to balance China, but together they do not look all that bad."